Please click on the button below to start the registration for individual participants. Follow the instructions to complete the registration. Please click on the button below to start the registration for groups. 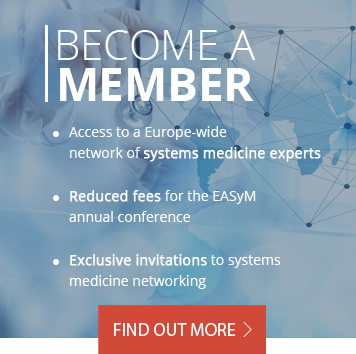 If you would like to benefit from the lower EASyM member fees and you are not yet a member, you can find information on becoming a member here. The registration fee includes the Opening reception on day 1; lunch on day 2 & 3; morning and afternoon tea and coffee on day 2 & 3. Tickets for attending the Systems Medicine hands-on workshop on Wednesday, 7th November can be purchased in addition for € 25,- for student/postdoc/junior doc and € 50,- for all others (maximum no. of attendees is 30 ). Tickets for attending the Gala Dinner on Thursday 8th November can be purchased in addition for € 50,-. Payment via credit card is possible (Visa, Mastercard & American Express). Registration fees must be paid in EUROS. There is no VAT included. Mark Two Academy, who handles registrations for EASyM, is exempted from VAT. Cancellation of registration has to be made by e-mail to the conference secretariat (easym2018@marktwo.nl) . If a cancellation is received before or on October 1, 2018, reimbursement of the registration fee, minus €75,- handling charges, will be made. After this date, or if registrants fail to attend the conference for any reason whatsoever, regrettably no refund can be made.